In her role as Global Director of the Smart Campaign, Ms. Barrès leads global efforts to keep clients first in microfinance. She is a member of the Center for Financial Inclusion’s management committee and comes to the Smart Campaign with over 20 years of experience in microfinance and the formal banking sector. Deeply motivated to reduce inequality and improve the lives of vulnerable people, she has devoted her career to spearheading innovative solutions that increase access to quality financial services and contribute to improving people’s lives. She strongly believes in the power of inter-disciplinary exchanges to fuel creativity. From 2007 to 2010, she managed Kiva’s early microfinance operations and developed its global strategy to maximize social impact. She helped to create the MIX in 2002, and led its strategic initiatives until 2007. Ms. Barrès has been a key contributor to best-practice publications on standards and financial performance monitoring, and is a founding member of Women Advancing Microfinance, the only organization for women professionals in microfinance. She is fluent in English, French and Spanish. 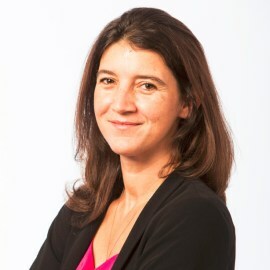 Ms. Barrès holds a bachelor’s degree in economics from the University of Montréal, an MBA from McGill University, and a post-graduate degree in development economics from the Sorbonne.